First published in 1938, this first book in C.S. Lewis's critically acclaimed space trilogy begins with a very intriguing scene that grabbed my attention immediately. I remained engrossed for the first several chapters and indeed for most of the book, although there were a few times in the middle that the story seemed to lag a little bit. This is by no means a fast-paced, action-packed read that one might expect from a science fiction novel. While it contains many of the trappings of a typical sci-fi story, such as spaceships, interplanetary travel, and aliens, this narrative comes at the genre from a much more cerebral and philosophical approach. It does not contain the characteristic space gadgets and weaponry, nor is it set in a futuristic world. It is altogether a very atypical science fiction story. The characters are interesting and well-developed. Even the alien races are fascinating and have very distinct characteristics. The protagonist, Dr. Ransom, is a likable fellow and in many cases, I found myself relating to his feelings. Dr. Ransom is a philologist and is therefore quite interested in the speech and language of the inhabitants of the planet Malacandra. While Lewis doesn’t dedicate large sections of the text to the language topic, he does make an effort to explain some of the vocabulary and rules of grammar of the Malacandrian speech. He doesn’t go nearly as in-depth as Tolkien did with his languages of Middle Earth, however. And though some may find this dull reading, I found it rather interesting. C.S. Lewis also gives very detailed descriptions of the landscapes and scenery, as well as the flora and fauna of Malacandra. These descriptions are vivid and he often uses comparisons to known objects on Earth in an effort to clarify for the reader. He also often makes reference to the natural laws, weather, gravitational pull and other fundamentals of life on the planet. For example, here is a description of the behavior of water on Malacandra: “...broken and swirling water that made a softer and more hissing sound than water on Earth...there was a bubbling and sparkling which suggested effervescence.” As with the language subject mentioned above, I didn’t find these details too cumbersome, though I can understand how some readers might. To me, all of the minutiae just helped to make the world that much more real and believable. 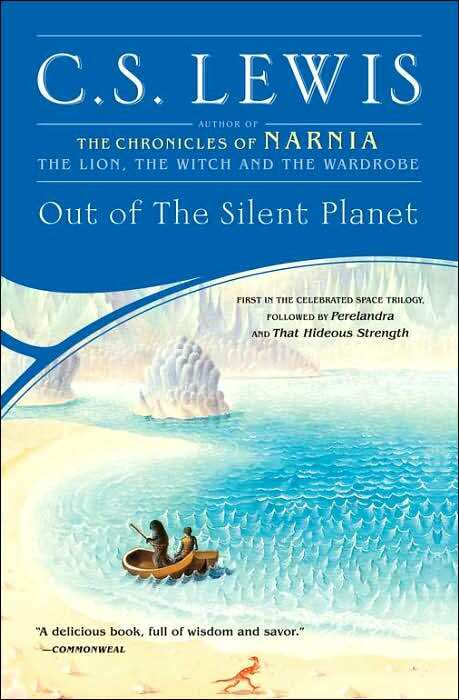 Fans of the Narnia stories may expect Out of the Silent Planet to have the same sort of allegorical themes as they do, but that is not the case. 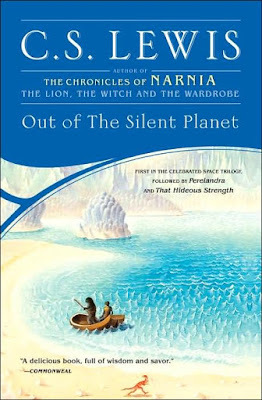 There are some correlations to Biblical principles that one may draw, but they are much more veiled than those found in Narnia and even the few connections I made were very tenuous and may prove incorrect as I move on to the next books in the trilogy. While I make no claims to being any sort of scholar of Lewis’s works, I didn’t find nearly the insight that I thought I might from one of his stories, but perhaps it will take a few reads to really let it all soak in. As an example of the philosophical approach of this story, here is one of my favorite passages from the book in which Dr. Ransom has just observed a spectacular scene unfolding before him, which I will not spoil here. The following is his reaction: “To every man, in his acquaintance with a new art, there comes a moment when that which before was meaningless first lifts, as it were, one corner of the curtain that hides its mystery, and reveals, in a burst of delight which later and fuller understanding can hardly ever equal, one glimpse of the indefinite possibilities within.” Not your typical sci-fi fare, to be sure, but I found it so poetic and a testament to the skill with which Lewis writes. While I really enjoyed this book, and will definitely continue the series and will most likely re-read this at some point, it does move slowly. There was also, to my dismay, several (at least half a dozen) instances of mild cursing throughout the book. For these reasons, I would recommend Out of the Silent Planet for older teens and up. It truly is a good space story without all the ray-guns, blasters, phasers, lasers and the other stereotypical elements of the genre. It is a story based on characters interacting with a world much different from their own and it was a pleasure to accompany them on the journey. Get your own copy of Out of the Silent Planet on Amazon.